A. A license acting as an agent shall not advertise property in a manner, which implies that no licensee is taking part in the offer for sale, lease or exchange. B. The commissioner may refuse to issue licenses to entities desiring to operate under names he determines to be potentially misleading or detrimental to the public interest. C. Advertising of any service for which a license is required shall not be under the name of a salesperson unless the name of the employing broker (DESERT DREAM REALTY) is also set forth. D. All advertising by licensees, including but not limited to, newspapers, magazines, circulars, business cards, and the Internet, shall include the name in which the employing broker’s license is held (DESERT DREAM REALTY) and the licensees name as it is on their license. E. In all advertisements the lettering used for the name of the employing broker shall appear in a manner, which is conspicuous and reasonably calculated to attract the attention of the public. F. All advertising shall be under the direct supervision of the employing/designated broker. All advertising must be submitted for the Broker’s approval before publishing. G. Prior to placing or erecting any sign giving notice that specific property is being offered sale, lease, rent, or exchange, a licensee must secure the written consent of the property owner, and any such sign shall be promptly removed upon request of the property owner. H. All advertising is subject to the Federal Truth in Lending Law known as Regulation Z. Any reference in an ad regarding extension of credit such as payments or interest rate on a new loan shall follow guidelines of Regulation Z and include the Annual Percentage Rate (APR) term of loan and amount of loan. I. The full name of DESERT DREAM REALTY must be in all advertising with the office number and address. The address can be omitted if the ad is a newspaper classified. Teams or Groups etc. must be submitted to the Broker for approval. Team or Group ads must contain the name of each member, with the exception of classified ads. J. Co-Advertising with affiliates is not permitted. Complaints to the Arizona Department of Real Estate, regarding this issue are forwarded to the FTC prompting an inquiry and explanation. K. You cannot advertise other Broker’s listings without written permission. L. Business cards must include the office address and phone number. M. You need a letter from the builder to advertise properties. N. Commission rates cannot be advertised. O. The Equal Housing logo must be displayed. P. The DESERT DREAM REALTY logo needs to be prominent. Q. Per Reg. Z, if the down payment, term of a loan, payment, interest rate, or APR are mentioned, then all must be displayed. R. Per Reg. Z, requires the APR to be displayed in the same size type as the interest rate. S. Per Reg. Z, “adjustable rate mortgage” ads require that “rates subject to increase after settlement” be included. T. Web-sites must have the Company logo “Prominently” displayed at the top of the site and on each page, per the ADRE. U. All business cards, post-cards, and flyers must be submitted to the Broker for approval, prior to issue. When utilizing “Just Listed” and “Just Sold” postcards, only the listing agent is allowed to advertise a property as “Just Sold”. This means only the listing agents can utilize these postcards. A. A salesperson or broker acting as an agent shall not advertise property in a manner that implies that no salesperson or broker is taking part in the offer for sale, lease, or exchange. B. Any salesperson or broker advertising the salesperson's or broker's own property for sale, lease, or exchange shall disclose the salesperson's or broker's status as a salesperson or broker, and as the property owner by placing the words "owner/agent" in the advertisement. C. A salesperson or broker shall ensure that all advertising contains accurate claims and representations, and fully states factual material relating to the information advertised. A salesperson or broker shall not misrepresent the facts or create misleading impressions. D. A school shall include its name, address and telephone number in all advertising of Department-approved courses. The school owner, director, or administrator shall supervise all advertising. The school owner shall ensure that the school's advertising is accurate. E. A salesperson or broker shall ensure that all advertising identifies in a clear and prominent manner the employing broker's legal name or the dba name contained on the employing broker's license certificate. F. A licensee who advertises property that is the subject of another person's real estate employment agreement shall display the name of the listing broker in a clear and prominent manner. G. The designated broker shall supervise all advertising, for real estate, cemetery, or membership camping brokerage services. H. A licensee shall not use the term "acre," either alone or modified, unless referring to an area of land representing 43,560 square feet. I. Before placing or erecting a sign giving notice that specific property is being offered for sale, lease, rent, or exchange, a salesperson or broker shall secure the written consent of the property owner, and the sign shall be promptly removed upon request of the property owner. J. The provisions of subsections (E) and (G) do not apply to advertising that does not refer to specific property. 2. The broker shall include the following legend, "Each (TRADE NAME or FRANCHISE) office is independently owned and operated," or a similar legend approved by the Commissioner, in a manner to attract the attention of the public. L. The use of an electronic medium, such as the Internet or web site technology, that targets residents of this state with the offering of a property interest or real estate brokerage services pertaining to property located in this state constitutes the dissemination of advertising as defined in A.R.S. § 32-2101(2). ***Also all advertising is subject to Federal Truth in Lending Law known as Regulation Z. Any reference in an ad regarding extension of credit such as payments or interest rate on a new loan shall follow guidelines of Regulation Z and include the Annual Percentage Rate (APR) term of loan and amount of loan. ALL ADVERTISING, INTERNET, BLOGS, LANDING PAGES, SOCIAL MEDIA PAGES, etc., MUST BE REVIEWED BY THE BROKER BEFORE PUBLISHING. DESERT DREAM REALTY SHALL NOT BE RESPONSIBLE FOR COSTS INCURRED BY AGENTS TO CORRECT AND OR COMPLY WITH ADVERTISING GUIDELINES OF THE STATE LAWS OR THE CORPORATE IDENTITY GUIDELINES OF DESERT DREAM REALTY. * The full name of Desert Dream Realty must be in all advertising. * Your web site, blogs, landing pages, social media pages, email campaigns or the like MUST be submitted to the Broker for review and approval. * Desert Dream Realty does not allow co-advertising with affiliates. Complaints to ADRE regarding this issue are forwarded to FTC prompting an inquiry and explanation. * You cannot advertise other Brokers’ listings without written permission. * Your business cards must include your office address and phone number. * You need a letter from the builder for permission to advertise their properties, or to use or take photos of their properties. * Commission rates cannot be advertised per your Broker. * Desert Dream Realty logo must be prominent. * As per Reg. Z, if the amount of down payment, term of loan, payment, interest rate or APR is mentioned then all must be disclosed. * As per Reg. Z, ARM ads require that “rates subject to increase after settlement” be included. * The Brokerage Logo/Broker Identification must be visible on all Internet landing pages without the need for moving the mouse, even on mobile phones. Upper left corner is best! *Videos must have your brokerage firm information on the first and last pages. Potential Fine. *When a listing is sold, agents must go on-line to mark their listing sold on You-Tube, Realtor.com, facebook, twitter etc. Potential Fine. *If a rental is occupied, not recommended to put a lockbox on it when listed for sale or rent. Potential major issues with tenant. Brokerage name, address and phone must be on any and all marketing materials and advertising, including printed or internet, flyers, ads, video, social media pages & posts, email signatures, etc. This includes your personal websites, facebook and other social media covers and pages. Video - ALL videos must have brokerage information at beginning and end of videos. If doing facebook live or other live video, must state brokerage name and who you are at beginning of video. “Hi, my name is (Name of Agent) and I am a real estate agent (with Team Name) at Desert Dream Realty in Cave Creek, AZ. Today we are touring the property at (address of property)”. Any videos of homes that have been SOLD must be marked SOLD or removed from where it has been posted! MLS numbers must be on ALL advertising of homes or property for sale, rent or lease including online and printed ads/flyers. REALTOR® - must be in all caps with registered mark. 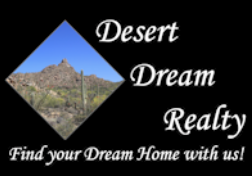 The DESERT DREAM REALTY logo needs to be prominent. All advertising must be approved by your broker.